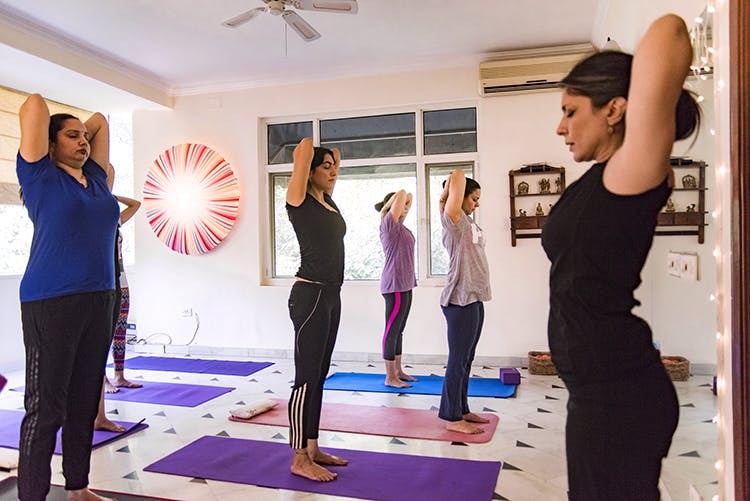 After nine years of having done yoga in the comfort of home, I stepped out to Mini Shastri’s Yogashala in Vasant Vihar for my very first class and came back rejuvenated. Having recently tried a yoga class in Bali got me wondering why I hadn’t taken one outside my house. The comfort of being at home and not being around strange beings was probably great for the nine years I did at home. With no knowledge and interest in the asanas, I performed like a diligent cat and stretched and centred my chakras. Now at 26 and more mindful about the duties and activities I indulge in, Mini Shastri’s Yogashala in Vasant Vihar called me for my first class. Shastri’s Yogashala completed 18 years of educating students/learners with the help of established teachers and heavy influence of the teachings from the south—Chennai and Mysore to be precise. The institute has gained popularity through word of mouth and extraordinary personal experiences; they train you in hatha yoga as a way of life. The Yogashala believes in wellness and an Ayurvedic lifestyle, macrobiotic eating, and discussions; buying and consuming-chemical free products from farmers and mindfully leading the life. PS: Hatha yoga stems out from focussing on the breathing. ‘Ha’ means the sun, and ‘Tha’ means the moon; it’s all about balancing the two aspects within our body.